Directions: In the center of Odense on the island Fyn in Denmark, you find the neighborhood called The Hans Christian Andersens neighborhood and there you find this (a more) streets like this one. H. C. Andersen neighborhood in Odense, Denmark, consists mostly of smaller one to two story front buildings with 1- story rear building. The houses are mostly built in the middle of the 1800. The current street scene is unique and the old houses in this town and the streets are well preserved with it its special nature and the urban environment. Behind the facades and houses you fint beautiful trails with superimposed green areas. In the neighborhood you find Nygade (New Street), the current Rosengade (Rose Street), popularly called Fy-street because thats where the prostitutes lived back the. 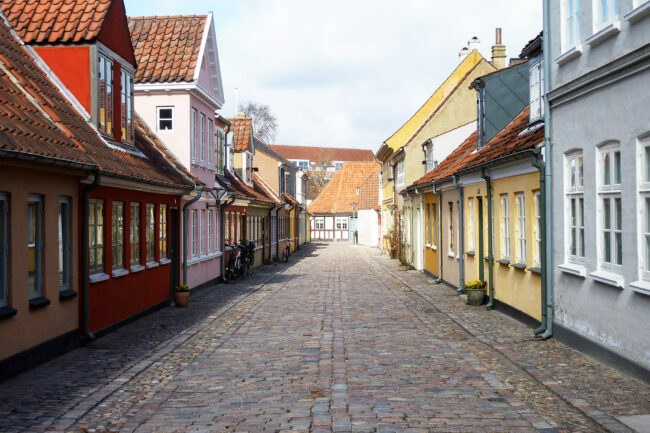 H. C. Andersen neighborhood is today a sought-after and expensive residential area in Odense with beautiful and well-preserved houses and courtyards. In the middle of the neighborhood, on the corner of Bangs Boder and Hans Jensen Street, you find the birth-house of Hans Christian Andersen the famous Danish author ho was born back in 1805. The photo is taken in the midday with a light overcast sky. Handheld, f/3.8, 1/400, ISO 80.